These three pieces (“The House and the Farm,” “Thinking about History,” and “Local People”) were originally published in my book Journeys Home: Thoughts and Places (Louisville, 1995). The pieces deal with family and personal history during the years 1970-1975, when I was in junior high and high school, but with reference to other times. Although the pieces also deal with places other than Four Mile Prairie in Fayette County, IL (my grandmother lived just north of the prairie, for instance), that land is a good centerpiece for these recollections. My thanks to my friend Michelle for transcribing these. I picked up the phone that Thursday night in January 1972. I’d turned fifteen four days earlier. The St. Louis evening news was nearly over; Johnny Carson was next on television. Confused at the fireman’s question over the phone line –“Is Mrs. Crawford with you?”–I told my mother something was wrong. My memories of that night open and close, like eyelids fighting sleep. I don’t remember my parents and me racing to Grandma Crawford’s house, down the familiar five-miles of U. S. 40 to the 185 turnoff in our Chevrolet. When the eyes open, we are on 185 and we glimpse the fireball on the night’s near horizon. The eyes fall then open, and we have turned off 185 onto the Brownstown Road and are down the lane in the driveway by the old barn. On their west sides, the barn, granary and milkhouse, glow in sickening, flickering light. The firemen do their best, spraying water over the flaming heap where a farmhouse had stood. But nothing is left to save. Mom is shattered. Her brother, we fear, might have a heart attack. Thinking back today, I don’t remember where my father was. Perhaps he was talking to the firemen or to Grandma’s neighbor Eddie who had called the department and bravely tried to break open the house’s side door, already too hot to touch. Sometimes I try to visualize the drive to Grandma’s, as it would look in one who had not taken it all his life. The eastern boundary of Vandalia looks junky to a person unblinded by nostalgia, the abandoned alignment of U.S. 40 which parallels the main road just beyond the river bridge; the boarded-up rink and bowling alley, “Junction Park,” where my mother went skating as a girl; the useless concrete supports that once held an historical marker honoring the National Road in Illinois. But farther on, there are the pretty, low, plowed fields between U.S. 40 and the Conrail tracks. There is the old Clark family home which that, my uncle remembered, was there when the road was the National Old Trails Highway and was one gravel lane. Horse-drawn wagons and cars, he said, had to pull over upon the shoulder to pass. Farther on still, there is the small, closed garage where my father took his big Diamond-T for oil changes (it required 48 quarts, he tells me); the proud rows of farm implements at a country dealership; the undulating land as one passes farms and a National Road inn at the intersection of the main highway and the long-overgrown track of the pioneer Vincennes Road. I loved the sight of 40’s cracked pavement; it seemed secure in its oldness. Five miles east of Vandalia, not far from a row of shade trees planted, I was told, by the CCC, deteriorating sections of previous alignments of 40 and 185 at an old sawmill signal the turnoff for Illinois 185. Both roads were realigned during the early Sixties to accommodate the pathway of 1-70. The roadbed of 185 shows an ugly seam where the road once went straight; the turnoff from 40 had been a quarter-mile or so west of the present one. Even as a toddler I knew that wrecked landscape was the halfway point to Grandma’s; it was no unimportant landmark. 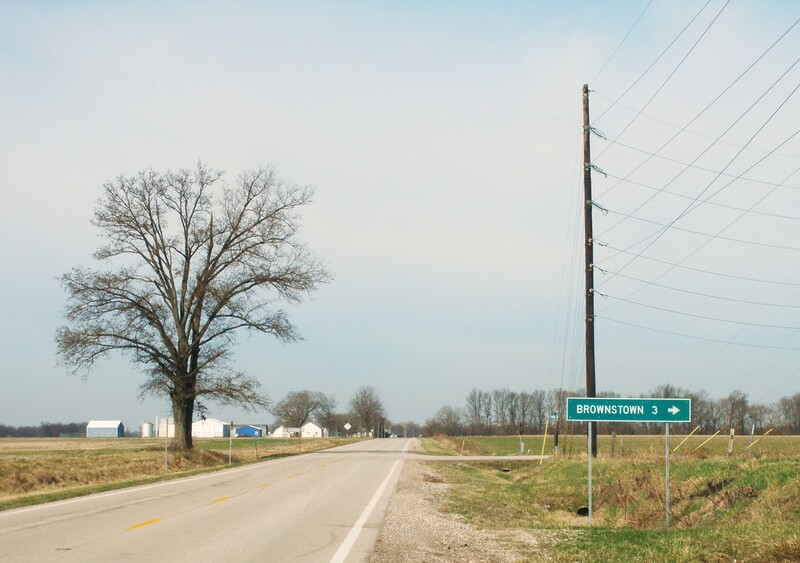 Forty continues east to Brownstown, a pleasant town of 700 where Mom went to high school. Turning onto 185 we passed through a small valley where great power lines proceed brightly to the left and right, then passed a hill where a solitary gravestone stood in pastureland, then we climbed up a small hill to a four-mile long stretch of prairie. “Four Mile” was the local name of that area where Grandma’s neighbors all lived, where Grandma and Grandpa were born and raised, and where ancestral families on Mom’s side had settled before the Civil War. I heard about these people all my life; most of them farmed small acreage, were moral, honest, and religious. “Shirttail” relatives still lived in the area, on Four Mile itself, at Brownstown, or in adjacent townships. Grandma’s farm is just north of the prairie, not far from the 185 turnoff onto the Brownstown Road. According to the farm abstract several nineteenth century relatives like Jonathan K. Pilcher, Thomas A. Gatewood, and Caroline Crawford owned portions of the property. Grandma was seventeen and “still at home” when her father Albert Pilcher built the farmhouse in 1907. The next year she and Josiah Crawford, with whom she had gone to school, were married. Albert Pilcher died in 1910, aged only 43. The story was told—a typical kind of story passed down through families— that Albert’s brother Waldo contracted tuberculosis, and that Albert lamented aloud that his brother wouldn’t live very long; then Albert “took sick” with diphtheria and Waldo outlived him by several years. My great-grandmother Abbie Pilcher subsequently sold or gave the house (I’m not sure which) to her only child and son-in-law, and there Grace and Joe lived and raised their own children—my uncle Harold and my mother. Harold and Mom grew up there, in a little rural neighborhood; they attended the Mahon Schoolhouse, ramshackle now, north of the farm, and walked the obligatory three miles to school. In past times the Crawford’s neighbors lived “just a stone’s throw” away; you could listen on a still day and hear them plow their fields. You could hear the trains pass through Brownstown in the northward distance. Grandma was 67 when I was born, and I knew her as a stooped little woman whose white hair was kept under a hairnet night and day, as if she hoped to save her hair, as she would the good china, for a special occasion, and if none came nothing had been wasted. My memories of her are a litany. She kept her hearing aid microphone in her brassiere and her teeth in a glass of water at night. She believed playing cards was a sin, working on Sunday was a sin (laboring in the kitchen on Sunday to feed relatives was not a sin!) — certainly baptizing people by sprinkling was, if not a sin, theologically unadvisable (especially babies, who had no sin or consciousness of sin and thus no need of public repentance which should precede baptism). But she was devout in a way I liked. She wasn’t “showy” about it; she didn’t parade her biblical knowledge but took seriously the Lord’s admonition to do good in secret and to trust his unfailing love. She gave me a Bible dictionary that I still use in my work. Slow to move around, her hard-headedness and resolve outran her decrepitude by many laps. That resolve joined with an eagerness to please which, unfortunately, sometimes set people at odds. She was very loving and also very opinionated and “set.” I remember how tenacious she was seeking a piece of historical verification-she remembered that Indian Head nickels were called “bull moose nickels” during the presidential campaign of 1912—but she never found anyone who’d take her seriously. She always drove, always had a car—this woman who never had indoor toilets nor a washing machine – as she sped down the road in a light green ’49 Ford, too deaf to hear the car rattle itself apart as she went to the Four Mile Store or to church up at Brownstown. Sometimes she attended the Four Mile congregation, a little country church near a field, a place where, to me, the rural ambiance of the Bible seems written right for such a church where the walls are old and good and the steeple is sound. Grandpa Joe farmed to make a living. But in the late 1940s a heart attack debilitated him physically, and he died in 1954. After his death Grandma stayed with my parents. She lived with us when I was born in 1957. She moved back to the farm around 1958 but she still came to spend the night with us many times. In her loneliness Grandma loved to note the rhythm of the days as they became shorter and longer during the year; she always planted her garden the same day each year. She let some of the fields go fallow—”back to the government” as Joe would’ve said it—but rented out the better land. She wasn’t in good health at the end. Her heart wasn’t good and a hysterectomy had left her weaker. Even as a child I came to her house with a certain sadness, because I was always the first one to enter her house when we visited, and I knew that if she had died there alone, I’d be the first to find her dead. Yet that fear never prevented me from running in first. She liked to spend her time writing letters and wrote me often. She once wrote me a wonderful letter describing with pride how she’d killed a pesky snake. I felt sorry for the snake, the odds were against it. A few years before her death she showed me her wedding pictures, and, like many children who only knew someone in their old age, I was startled to realize what a very lovely woman she had been. I still look at that picture, and still am startled, since I recognize in her astonishingly pretty features—the clear gaze, the high forehead and jawline characteristic of the Pilchers—qualities of the face I only knew in her old age. She was widowed after 46 years of marriage. (Everyone liked my grandfather, I’m told, in spite of the fact that he was the county tax assessor for a while, and was also outspoken in his Democratic politics. Fayette County democrats like Dale Tedrick and Judge Burnside sometimes came to the house for informal planning sessions. Grandpa would turn off Jack Benny, even Jack Benny, from the radio and delight in the politicking.) Some cousins announced their golden wedding anniversary and I remarked that that was a rare event. Grandma scolded me a little, noting that she and Joe had married over fifty years before. True enough, but I didn’t argue with her, not understanding what she meant, knowing neither death nor the kind of love which is stronger by far than death. As a boy I roamed Grandma’s farm. Like riding in a car the place was a kind of dialectic between the enclosed and the open, the bounded and limitless—land that though parceled is vast and full. A soft, sticky layer of cedar needles covered the grass by the house; two or three tall spruce trees shaded an old, working pump. The yard sloped downward toward a shallow ravine in which some tall trees grew and where a grape arbor once thrived. I loved to see the land through the dusty window of Grandmother’s living room as I sat amid the warmth of her coal stove, as red birds and snow birds flew by. As Annie Dillard puts it, the place was like the Platonic form of “farm” (except that the forms are everlasting). The yard was bounded by a fence and a tangled thicket of briars, flowers and vines which kept Grandmother’s renters’ cattle away from the yard and her enclosed garden. The yard had warm embrace yet was open and sunny, smelling of summer’s blossoms and grass. The small disused milkhouse sat in the yard, filled with bundled up newspapers, Saturday Evening Posts and Reader’s Digests. Sometimes I pitched soda bottles into the open space between the garden fence and the milkhouse and cistern. There they lay, among the blooming lilacs, honeysuckle, and pokeberry bushes, lighted upon by monarchs and swallowtails until someone picked them up and took them to the store for pennies back. The house, milkhouse, granary, and two barns formed an irregular west to east line, a boundary between the yard and farm. The fence of barbed wire and white oaks limbs stood at varying angles. The driveway came in at the granary, which was used as a garage, and turned east past the largest barn and exited the road again at the fence. Homely, humorous cardboard ads for Champagne Velvet beer, depicting fat men fishing in streams, had been used to patch holes in the granary’s side. By the time Albert Pilcher died and my grandparents acquired the house, the automotive age had begun: my uncle remembered that his father’s first car was a Maxwell, purchased in 1916 (“the year we put up the silo,” Harold said, which incidentally “didn’t have a knot in it”). A door from a ’37 Chevrolet had been used to patch a hole in the fence beside the granary, and I always fancied as a kid that the door, once opened, would magically take one into a blessed kind of land, a magical woods where spirits or ancestors lived. Yet the automotive era had not entirely taken over the farm: as a boy I was told that much of the farming was done by teams. The greater barn stood proudly at the eastern end of the yard. Albert Pilcher had built it using wooden pegs instead of nails. An enormous maple tree shaded that side of the yard, and on bright days I loved to run along the driveway, breathe the stale smells, and rest in the grass beneath the maple. A smaller barn just beyond the fence seemed on the verge of collapse; I was strictly forbidden to play there. Yet it was all right for me to stay outside the barns and linger in the shade and crawl through the tangled vines by the fence. It was all right to linger in the remnants of the adjacent orchard and toss apples at the gray planks. And there was the marvelous clutter of the farm, years of tasks waiting to be finished, the land trampled and fertilized by cattle. I loved flying kites on the adjacent field, among harvested stalks and dry tassels; I loved exploring the old chickenhouse, with its coops and groundhog holes. I loved to follow the trail past the salt block and the white stone that marked our cocker spaniel’s grave. Is the pond still there, now that I’m no longer a kid shooting at space ships from the sky with the loaded end of a fishing pole, or shooting at toads with my BB gun, or chasing dragonflies up the grassy bank? And if I follow the wooded paths as far as they go, could I find my way to the stump of the paw paw tree which my mother had loved as a girl, all the way to the north road and the one-room school? Could I still feel the glad anticipation of a hike following an overwhelming Sunday meal with apple pie? When I first studied Thomistic philosophy I was struck by a definition of “truth.” Truth is adaequatio intellectus et rei: the intellectual idea is true when it corresponds to the thing itself. That struck me because, in the case of a house fire, grief and truth conjoin as one accepts in one’s mind and heart the reality of what has happened. My mother and uncle grew up in that house and grieved most deeply. Mom felt the loss of her mother immediately, then lost one thing at a time in memory: jewelry, an old guitar, the family bible, the rocking chair, and the hope that, when a life ends, the end will verify, by its good and peaceful manner, the meaning of that life. I felt that loss too: the painful and arbitrary recollection like unanticipated needles in your skin. But grief is a misbehaving thing, straying from its partner truth. I thought I’d handled Grandma’s death well, except for a strange reticence to speak of it and a pessimism, a heavy and fatalistic perplexity that emerged at odd moments. Adolescents are long on self-consciousness, short on productive introspection, and I went about my schooling and my career. But fourteen years later nearly to the day, the Space Shuttle Challenger exploded. I could scarcely contain my rage—rage at God, rage at “circumstances.” Why this? Don’t horrible events daily fill the news? I traced my feelings back to an earlier, more personal rage, and finally faced what had happened in 1972. The delay was not difficult to understand. I saw my grandmother alive one Sunday afternoon, and then I never saw her again, alive or dead. The following Thursday night she literally disappeared from the earth. She was like an MIA. She was like the prophet Elijah who disappeared into heaven as Elisha cried out, “Father, father! The chariots of Israel and its horsemen!” Without the dreadful tasks of an open-casket visitation then of dividing goods and discarding clothing—all to make the loss seem hard and real-Grandma’s death never seemed believable. But Grandma’s house is another story. I never saw Grandma again, but I saw her house “die.” And although my grief at Grandma’s death was delayed, I have always, in a real way, mourned the house and felt cast down by its violent end. This, too, I did not understand until years later. I watched my daughter roam our house with a toddler’s relentless curiosity. I thought of Grandma and wished the two of them could have met. Then I realized … I must have roamed her house relentlessly as a child. It was a loved house, but not my home, so it was strange from the first, filled with simple specifics of an era before my time. I was also very bored. At the farm most of my family were adults— adults who by no means ignored me, but adults nonetheless. Sometimes only Mom, Dad, and I came to see Grandma, sometimes Harold and Tillie were there too. Harold and Tillie had four sons, all born in the Thirties and early Forties, so my first cousins were married adults when I was a young boy in the Sixties. When the sons came back to Vandalia, we all met at the farmhouse. Grandma remained close to her five sisters-in-law, all born in the 1890s and early 1900s. Three of my great-aunts lived in the area and one of them lived in St. Louis, and when Aunt Jean came from St. Louis with her daughter and son-in-law, the other great-aunts with their own adult children would come to the farmhouse, and the “get-together” would become quite a crowd, a regular Crawford reunion. A tremendous, group-prepared meal ensued, with ham and potatoes and vegetables and “thirty-day slaw” and Grandma’s pies. Then the adults walked the farm, sat in the comfortable house, talked about Vietnam and other news, talked politics, religion, other people, and family lore. They looked through Grandma’s old pictures and talked about the Depression and the New Deal. Meanwhile, shy and bored, I thoroughly toured the quarters and unintentionally memorized the house. I memorized the weathered gray wood and the rusted, torn wire screen of the front porch, the torn, dusty porch seats piled high with newspapers. Wasps nested in the eaves and made their lazy, fearless way in and out of the porch and round about the ears of house guests. I was terrified of them for years and ran screaming from them. But they met a proper end. I memorized Grandma’s kitchen: the table in the center of the room; another table filled with flour bags and empty egg cartons; an old refrigerator, in which, for a while, Grandma kept an opossum’s tail which she’d proudly retrieved from one of her traps; the kitchen counter and tall battered cabinets; the pump which brought the only water into the house; the peachlike leaves of African violets which Grandma set in the dusty window sills; the sunny pantry. I remember Grandma’s old calendars there, hidden behind her aprons and rags, made mysterious by their being veiled with ragged cloth. They were typical kinds of calendars given out by country stores and filling stations, with trademark symbols of Good Gulf or Bunny Bread or happy farm scenes under which one placed the spent month. I memorized the rough-textured, burgundy sofa on which Grandma slept at night; her father’s well-worn rocking chair, a table in the corner piled with local papers, her purse and pocket items, and the dictionary in which she proudly saved a drawing of a stop sign which I’d made at the tender age of 34 months. I memorized the front bedroom, with its four-poster bed and lumpy mattress, the tall, walnut wardrobe filled with linens; I memorized the corner bedroom with its muted sunniness, figurines, and jewelry set upon a small vanity. Most of all I memorized the sunny corner family room. I sometimes wonder if I both “got religion” and “got history” in that family room. I liked to sit alone in that room and read and think. I’d read the Pilcher family history which Grandma’s cousin Blanche had compiled in the 1930s. I liked reading other things, like the theological books written by C.C. Crawford, a distant cousin. I liked them because they looked and smelled like books from the 1910s and 1920s — they were both sentimentally and theologically appealing. I also liked the possibility of becoming one who writes books. Grandma kept her family photographs in that room—pictures of folk long dead or grown old, folk who had shopped in “my” downtown during its earlier eras. If the adults hadn’t claimed them already, I’d look through those pictures. All these books and keepsakes gave my imagination a kind of fond access both to Time and to Eternity. It was an introduction to Eternity that, thanks to direction later, was sufficient to help me withstand the hurt inflicted by Time to the farm. I didn’t like going upstairs. I had a fear of it. Yet it was sunny and bright too, with sunbeams streaming through the crusty windows. Like Andrew Wyeth’s “Olsens” paintings, the upstairs had a bone dry quality, a faded world over which a thick pall of dust had settled. The curtains had lost their color to the sun and dead flies, wasps, and wasps’ mud nests lay on the floor. Boxes of local papers and a variety of castaway items were piled about. The upstairs was the kind of place where, I always feared, I’d turn around and encounter someone strange, hiding, hostile, a revenant or intruder. Grandma never locked her doors. But I don’t quite relive the fear in my memories, only the love for a place I once visited, and do still. Coming to Grandma’s house, I felt as though I was entering another world. I was, more so than I realized at the time. The house, the barns, the farm, the one room school—all dated from an era when a farmer could make a good living upon a comparatively few acres, with horse-drawn implements. The parents of my wife and me both left family farms for blue-and white-collar jobs and so our young daughter, two generations removed from an agricultural life, is fascinated that someone might actually live on a farm. What does that say about the future of American agriculture, and a time-honored way of life? Too, as I have written here, Grandma never had indoor plumbing but always had a car, facts which speak of earlier times than my own. (Grandma’s house was never modernized to the extent of many of her neighbors’ homes.) I have read many books about this era, the very fact of owning a car was revolutionizing country living even as Grandma was a younger adult. Small rural stores and country churches became less and less the chief community gathering spots in places such as this. Newer supermarket chains sprung up around the country, and other changed aspects of mercantilism arose in response to the greater mobility of rural people thanks to the automobile. Fewer people needed to stay on the family farms. Eventually the automobile spelled doom, too, for the small-town mercantilism in which my mother worked prior to my birth, in so far as “Main Street” became superseded by rerouted highways, interstates, and mulls. All this is an old and well-chronicled story, of course. I mention it here because Albert Pilcher missed most of it, and his only child who loved to drive lived rooted in both the old and the new. I, Grace’s youngest grandson, feel nostalgic for a whole range of midwestern life as it changed over time. Grandma and her farm are never far from my thoughts as I study theology and contemplate the difficulty of holding to three statements: (1) God is good, (2) God is almighty, and (3) evil and sorrow exist. Scripture does not resolve the difficulty except to raise doxologies to God and to call one to accountability in the present. Somehow–perhaps because I didn’t emotionally confront the event until years later–when I first considered a religious vocation I was able happily to respond to that call without a cynicism which the fire could have easily stirred in me. (Our minister thoughtfully told us, “I trust no one will be foolish enough to tell you ‘This was God’s will,’” and that stayed with me.) The “why” question will persist, of course, until I no longer peer through the dark glass of this existence. I myself am Job on the ash heap, unable to curse the God I dearly love but unable to fathom what I see: the evening news which brings knowledge of tragedies greater than mine, and the deeper sorrows which my friends and acquaintances bear, with a faith and a strength which shame my own. And yet–at the risk of sounding superficial–that ash heap taught me, early and decisively, a potentially positive thing: that none of us knows how much time we have. We all know this, but we wait to face the full implications and responsibilities until we must. For once, waiting seems preferable. So ever since January 1972, and especially in my adult life, I’ve tried to strike an overall balance. I’ve considered my own special calling the balancing several areas of service and living. For instance, I try never to shortchange my family amid an active professional life. (I’m proud to say that, at this writing, I’ve stayed home with our daughter for five consecutive summers–times I’d never exchange for anything.) I’ve tried to balance life and prayer; to be concerned for art and music. I’ve tried to be generous with praise, love and encouragement; to make amends when I’ve erred; to know that to be called of God does not mean that my way of seeing things is the only way; to subdue ego in order to maintain a sense of service; to be modest and genuine, to do good in secret, always to be an instrument of God’s Spirit who brings our work to fruition. I’ve tried to live according to a proper balance of head and heart. I’ve had a busy professional life: by the time I was 40 I had served churches, taught many college classes (history, philosophy, and religion), and had written four books and numerous shorter pieces. Best of all, people usually don’t learn from me about these accomplishments. Before I break into a rousing rendition of “I Did It My Way,” let me reiterate my point. If I die anytime soon, I’ll know I did as much good as I could with the talents God gave to me. I’ve tried never to postpone, to avoid ways in which I may be of service to people. I know that people can be influenced tremendously by simple kindnesses, by an offhand remark, by sitting quietly in beloved rooms. Who knows? Maybe someone will be helped by the Spirit through something I write or say, some encouragement or kindness. So I fling my bread upon the waters, not presuming to wait till some probable yet never-guaranteed tomorrow. Sometimes a tragedy can point you to a right and mindful way to live. Grandma’s farm lived in my reverie for many years, and does still. For years in my daydreams, the house was intact, but it was empty, awaiting occupancy as it did for those years when Grandma lived with Mom and Dad. I also had a dream, about once or twice a year, that it had all been a mistake–the firemen and coroner had been wrong. All the while, the place seemed to transfigure in my mind. I’d read poems by Bryant and Whitman, and they seemed to be describing that very place. I’d read other things-Annie Dillard’s Pilgrim at Tinker Creek, stories by Faulkner, poetry by Frost (“The Need to Be Versed in Country Things”), Richard Eberhart’s poem “The Groundhog” – and my mind quite naturally made a mental picture of the locations therein, the house and farm and the woods. Durand’s famous painting Kindred Spirits seemed to depict the very gullies and waters of Grandma’s place. Too, the quality of certain pieces of music invariably triggered memories and associations: especially Appalachian Spring and others by Copland, Vaughan Williams’ third and fifth symphonies, John Rutter’s Requiem and “I Will Lift Up My Eyes,” pieces by Mendelssohn and Mozart, and others—my desert island music. Then the event “hit” me in 1986. Soon afterwards I went to the farm again for a long-delayed recognition. Since 1972 I had visited the farm a few times; I knew what to expect. No one had had the heart to keep up the yard, which became overgrown very soon — “back to the government”—and trespassers had stolen some of the barn wood. Time and the elements claimed the place. I recalled Bryant’s poetic image of Nature as caregiver, which still seemed lovely but also seemed a cruel hoax in the face of something as capricious as this. The prophet Isaiah said, “All flesh is grass, and all its beauty is like the flower of the field.” The yard, which I remember as freshly mowed, upkeep, and sunny, was colored in the brown, olive, amber and pink: winter’s half-transparent shades of grass and brush. The field’s flowers, the milkweed, foxtail, and witchgrass grew wildly. I remembered the bright house, and the house was grass, and Grandma was gone. I slept poorly for several nights. I am one of the younger people who recall the house vividly. The land was ancestral before the house was gone, and my own dearest memories are something which my daughter will ever consider part of the past. Yet the farm has a quality which I’ve found in other local landscapes as well. That quality is the power of one’s favorite places to become the landscapes of one’s soul. “Our” landscapes are, of course, not always ours at all. White settlers were not the first, nor “the right.” Neither is “your” property yours at all. Stop paying property taxes and find out, or try to “take it with you.” But the love of place is still an essential one for us, whether one “own” the beloved place or not. The slow changes in the character of lands and places often brings a wistfulness and sense of simple, passive nostalgia, and because those changes are slow over time the change itself becomes part of the experience of being “from” that place. Yet when the alteration of the landscape involves a more deep and personal loss-and when change is terrible and swift—the love of place takes on altogether different meanings. Then that love becomes rooted in deeper feelings, and it begins transfiguring the lost place in memory, the same way we tend to idolize the person whom we’ve lost to death. That is when the love of place becomes not just a nostalgic sigh, but the deepest of longings. Something essential has been taken from you, even as someone essential to you has died. Yet that essential thing never leaves you either. Today I pull into the weed-choked driveway, leave the car, and walk. I have never again dreamed that dream about Grandma and her house. But now, somehow, whenever I think of the house, it is not empty. I see Grandma in it once again, puttering around in her old-woman way—a stubborn, kindly old woman. And I’m a young boy coming in to grab an icy Orange Crush and talk to her. The house no longer awaits occupancy in lonely abandonment. The tragedy remains, of course. But in the realm of dreams where we live in our first homes, I have ever after dwelt in peace. I have an assurance of things unseen, and can enjoy coming to the farm with a fresh and loving gratitude to God for the wonderful things we are given in life. There are places stronger and deeper than change, and loves which are stronger by far than death. The Lyndon Johnson reference is from the president’s memoir, The Vantage Point: Perspectives of a Presidency, 1963-1969 (New York, 1971), p. 213). The Annie Dillard reference is from Teaching a Stone to Talk (New York, 1982), p. 133. Although these are personal memories, several sources gave me a larger context. Gaston Bachelard’s The Poetics of Space (Boston, 1969), has interesting discussions of lost space, creative boredom, rooms, and corners. Other sources include Gerald Carson, The Old Country Store (New York, 1954); Herman Mattern, “The Growth of Landscape Consciousness,” Landscape 15 (Spring 1966); Sidney E. Mead, The Lively Experiment (New York, 1963), 5; Hugh C. Prince, “The Geographical Imagination,” Landscape 11 (Winter 1961-1962), 7-11; Norman R. Stewart, “The Mark of the Pioneer,” Landscape 15 (Autumn 1965); R. Burton litton, Jr., “Time, Trees, and Places,” Landscape 15 (Spring 1966), 21-24; Yi-Fu Tuan, Topophilia (Brunswick, 1974); Thomas and Geraldine Vale, U.S. 40 Today (Madison, NJ, 1983); May T. Watts, Reading the Landscape of America (New York, 1975). The quotation of 2 Kings 2:12 echoes the conclusion of Annie Dillard’s Holy the Firm (New York, 1978). In 1918 and 1924 the state of Illinois began numbering state highways as part of the State Bond Issue system. The last of these state roads was none other than my beloved IL 185, which at that time went from Bluff City to Farina and only later extended through Vandalia to Hillsboro. Hello! Thanks for your very nice comments! Who were your Pilcher great-grandparents? I have the Pilcher family history (though it’s not up to date). I, too, am a Pilcher relative. I have geneaology dating pretty far back that my mother researched. She was a Radliff from Brownstown whose mother’s family (Robert McMillan’s) ran a store in Four Mile. My mom’s parents, grandparents and some brothers who died young are buried in Pilcher Cemetery. Hello! Yes, I’m related to the McMillans. My great-great-grandfather Andrew Crawford had an older sister named Mary Ann Scrote, whose daughter Tabitha was the first wife of Robert McMillan. (All of these folks are buried close by in the Pilcher Cemetery.) Then Robert and his second wife were the parents of Ella Radliff, whom I remember well. You probably know all these connections already (and I think I have all that right—-I’ll double-check). As you say, some of the young McMillan children are buried out at the Pilcher Cemetery, too. I’ve twenty direct ancestors buried out there and numerous uncles and aunts and cousins. Very good, I grew up down the road from Four Mile, we stopped there often. Turn south the Expermental Farm, to Arm Prairie (Chickenfoot), this brought back many memories. Hi, Janice. Thank you so much! I know where Chickenfoot is. I still like to visit the Four Mile area. I have a photo of the eastern end of Four Mile as the header photo of my other blog. Take care!